They say that great things come in small packages. That couldn't be any more accurate than with the kiwi. This small, unassuming fruit is actually packed full of tons of vitamins, minerals and natural chemicals that help your body in a myriad of ways. This tropical fruit is a tasty way to introduce the family to healthy alternatives to cookies and cupcakes. While most people think of Oranges for their Vitamin C content, Kiwis actually contain more Vitamin C than the same amount of orange, with 85 percent of your daily value nestled inside the small green fruit, according to World's Healthiest Foods. Kiwi is fat free. Zilch. Zero. Zip. If you're monitoring your fat intake, kiwi is a great fruit to add to your diet. The low glycemic level of a kiwi means that it is low-carb and it's a safe fruit for diabetics to enjoy, according to California Kiwi Fruit. If you need more fiber in your diet, add some kiwi slices to your morning oatmeal. Kiwi has more fiber than a serving of bran cereal, according to California Kiwi Fruit, and it probably tastes better too. If you need to get better Zs, try noshing on kiwi. The fruit contains antioxidants, which are tied to better, deeper sleep. Nosh on two kiwi fruits about an hour before you nod off to get maximum benefits, Food NDTV recommends. The high levels of dietary fiber in the kiwi fruit helps keep your digestive system running properly. Not only that, the fiber helps control blood pressure, blood sugar and can help you feel fuller longer, according to Food NDTV. Food NDTV reports that Kiwi fruit contains significant levels of folate, which is believed to be beneficial for pregnant women. The vitamin aids in the development of the fetus. Kiwi is loaded with tons of vitamins and minerals including potassium, calcium, iron, and magnesium. Toss in a few B-vitamins and you have the perfect formula for healthier skin. These vitamins and minerals help with blood circulation and stress relief. 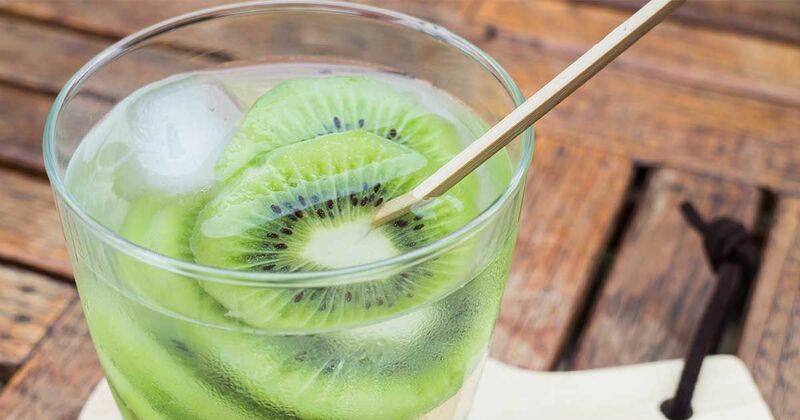 Kiwis contain natural chemicals that can help reduce the risk of macular degeneration by almost 40 percent, according to Care 2. The lutein and zeaxanthin in the kiwi fruit are also found naturally in the human eye. The high levels of vitamin C help your body fight off viruses and bacteria. Toss in high levels of fiber and chemicals that help your body's digestive system and this fruit is ready to keep your immune system healthy. One of the best things about this healthy fruit is that it's cheap. While the California grown kiwi is usually only available through May, you can purchase different Kiwis all year long, at around .50 cents per fruit. What is your favorite way to enjoy kiwi fruit? Share your favorite recipe in the comments below.